I have never really like Geology. If I am honest I found it a bit boring. So when the kids started getting a big interested in the type of rocks and how they were formed and what happens when the plates move I was a bit stressed. I was not sure how I could make it interesting for both them and me (because lets me honest the kids know when you are finding a topic boring). And then I heard about this book and Quartro Publishers send us a copy to use. This book is amazing. It has transformed what was a boring topic for me into something interesting. As soon as we have finished the latest experiment I am already looking ahead to make sure we have everything in the cupboard for the next. And my kids, think this book is a gem, they keep wanting to do more and to redo the experiments. The book is broken down into 12 units and within each unit there are three plus experiments (52 experiments in total). The units flow really nicely one after each other so if you are a bit Geology-scared like I was you can start at the beginning and work your way through. (Having said that we did not do every experiment within each unit). Each experiment is set out with easy to manage steps, photographs and a “Science Behind the Fun” section. I am a bit of a Pinterest-crazy home-educating mom and I have seen three of these experiments on Pinterest and possibly if I searched harder I might find more (but really 3 out of 52 experiments for me this book beats Pinterest hands-down). What I really like about these experiments is they are visual representations of what the kids are learning. The Cocoa crust experiment really showed how the earths crust would move around because of the heat from under it. My kids Loved this one, my youngest got really excited when the cocoa started breaking up and the cream was coming through the weaker parts – he exclaimed ” mom look – it’s just the thin sections of the earths crust where the everything seeps through”. And yes I would advise parent supervision with these experiments (some experiments like this one and a few others that we tried involved using the stove). Likewise the Chocolate Rock Cycle was ingenious – using chocolate to show the cycle rocks go through – no-one will forget that. And using sugar cubes to illustrate the boulders, cobbles, pebbles and sand, brilliant. I could go on and on with example after example. My kids and I highly recommend this book. It has brought Geology to life for us and by bringing the topics to life it has made them all incredibly easy to understand and remember. We are still working our way through this book but I have read ahead and the experiments awaiting us are just as good. Geology Lab for Kids is one of the books included in Quarto’s new STEAM platform – they have grouped some recommended books together for different STEAM topics and have created some Free to download teacher guides for each topic (I really like this new set-up) – this is the link for the Geology Rocks Books . 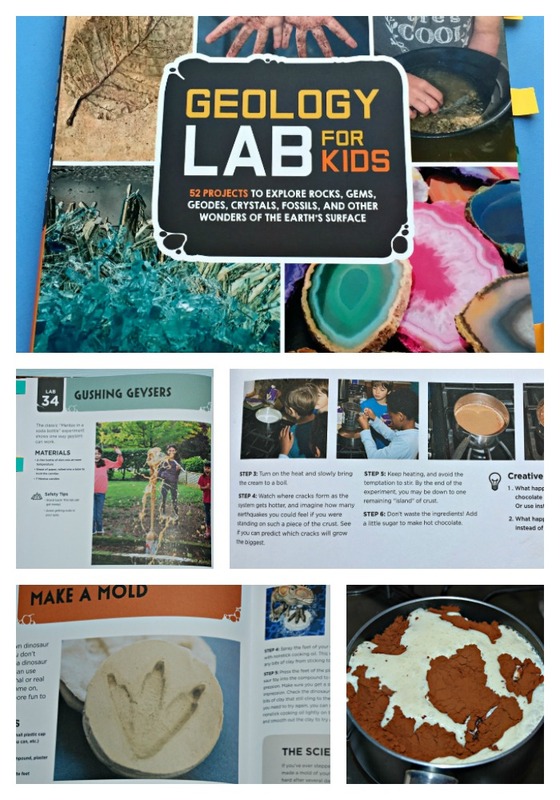 This entry was posted in Book Ideas and tagged educational books, educational resources, Geology Lab for kids, home education, homeschooling, STEAM. Bookmark the permalink. It really has helped me find Geology interesting and fun.